Settled in fifth in the early stages of the mile contest by William Buick under a stern gallop set by Ribchester's pacemaker Toscanini, the four-year-old son of Iffraaj ran on resolutely when hitting the front over a furlong out to fend off the challenge of William Haggas' Mutakayyef, who was a length and a quarter behind in second, with a neck back to Aidan O'Brien's Deauville in third. Fahey suggested a tilt at the Sussex Stakes at Goodwood is next on the agenda for the colt. 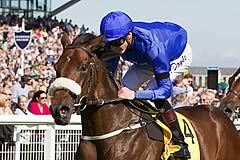 Fahey commented: "The Sussex Stakes is where he has to go really. The French race [Prix Jacques Le Marois] which he won last year is only 10 days after the Sussex so we can't go to both. I was always hoping that he would stay further but at the moment, I don't need to go further." Mutakayyef finished second to 11/10 favourite Ribchester, while Deauville took third place. The William Haggas-trained Mutakayyef, a 5/1 shot, was a length and quarter behind the Richard Fahey-trained winner, with Deauville, trained by Aidan O'Brien and ridden by Ryan Moore, a neck further back. Jim Crowley, rider of Mutakayyef and the current champion jockey, said: "That was a good run - he just couldn't get to the winner." Dr Jim Hay, part-owner of Deauville, said: "That was a fantastic run. He is a very flexible horse; probably nine furlongs is his perfect distance. But he needs it like today - he needs firm going, and he doesn't get it very often. No doubt Aidan [O'Brien] and the rest of the lads will have a chat and work out where to go next." Deauville was dropping back in trip after finishing third in the 10-furlong Tattersalls Gold Cup at the Curragh last time out. There was a stewards' enquiry into the placing of the second and third horses, but the result remained unaltered.